Ask yourself a few simple questions and you can easily assess if you are on your way to building muscle. Are you more focused on what’s happening on the TV at your gym than your next set? Reading a book or magazine while training? Scrolling through your Facebook news feed between sets? Texting the girl you met at the bar last night while performing your set on the leg extension? You are certainly not building muscle, my friend! I don’t care if it was a warm-up set or not. You know by now that building muscle is not easy. It requires hard work and a smart approach. Have you been trying to add size but struggling to get any bigger? There are 5 reasons why you are not building muscle. But, building muscle is not about lifting as much weight as possible all the time! Yes, there is a time to work on maximal strength development. And progressive overload (adding more weight to the bar) is absolutely important. However, if you are concerned with hypertrophy training you need to think about more than just moving a weight from Point A to Point B. No one cares how much weight you can bounce off of your chest with your hips a foot in the air. Especially the girl over on the elliptical you think you are impressing. Careless execution of the exercises you perform will not only impair your gains, but could also lead to injury. One of the most important factors in hypertrophy training is your ability to create tension in the muscle you are trying to work. Put simply, tension is the force that is directed through a muscle. Focus on initiating every contraction from the muscle you are trying to work. Don’t just go through the motions. Contract the muscle as hard as you can with each repetition. This is absolutely critical when you are concerned with hypertrophy training. Don’t just go through the motions. Contract the muscle as hard as you can with each repetition. Image courtesy of Elite Mens Guide. For example, you may be doing a back exercise (such as a rowing movement). You feel the majority of the work being performed by the arms as opposed to the back. This means there is minimal tension on the back muscles. The tension is moved from the working muscles (rhomboids, lats, traps) and distributed to the assisting muscles (biceps & forearms). They take the majority of the load. Your back is not getting the stimulus it needs to grow. This can happen easily if you are carelessly pulling the weight without intention. Proper exercise execution is a huge part of creating maximal tension. Muscular tension can be increased without increasing the actual amount of weight you are using. Mind-muscle connection refers to the ability to focus on a muscle using the mind, and contract it with a great amount of force. When you develop this mental concentration, you can actually get a greater amount of muscle fibers to fire and contract! Cool right? More muscle fibers being recruited (greater contractions) = more muscular tension = more growth. With a strong mind-muscle connection, you can also control where tension is placed and which muscles do the work. This is extremely valuable. Metabolic Stress- achieved when you train for the pump and produce a ton of lactic acid build up. When looking to maximize metabolic stress, the goal is to pump as much blood into the working muscle as possible and create cell swelling. This triggers growth. Mechanical Tension- achieved when you lift heavy. You must create the greatest amount of force production and tension in the muscle as possible. Muscle Damage- achieved when training actually results in damage to muscle tissue (when your muscles feel sore 1-2 days afterwards). Incorporate slower eccentrics, greater ranges of motion, a variety of exercises and angles, and a high degree of tension in the stretched position of the muscle to increase this. In order to maximize muscle growth, you want to exploit all three mechanisms of hypertrophy in your training. So what does that look like? First off, your program should be centered around basic compound movements. If you spend more time doing Single Arm Bicep Concentration Curls and Tricep Rope Pressdowns than Squatting and Deadlifting, then something is not right. You need to get your priorities in line. If you spend more time doing Single Arm Bicep Concentration Curls and Tricep Rope Pressdowns than Squatting and Deadlifting, then something is not right. Image courtesy of Fitness 4 Muscle. Compound movements allow you to use heavier loads. You will recruit the motor units that have the highest capacity for growth and maximize mechanical tension. They allow for multiple large muscle groups to be worked at once, which equates to more efficient training or better “bang for your buck” so to say. These exercises help you develop the most muscle mass and strength. They also play a role in reducing body fat by ramping up caloric expenditure. Compound exercises, like rows, for multiple large muscle groups to be worked at once, which equates to more efficient training or better “bang for your buck”. Image courtesy of GTA Fitness. What about isolation work? Useless? NO! Of course not. Isolation movements are part of a well-rounded physique development program. They help fill in any gaps you may want to work on. Start your training with a couple compound movements. Hit them hard. By focusing on compound lifts that allow you to recruit a lot of muscle mass at the beginning of the session, you can maximize mechanical tension. Follow up your main compound lifts with higher rep work (8-20 reps). Consider incorporating intensification techniques to maximize metabolic stress and muscle damage. These include super sets, drop sets, and giant sets. This way you can incorporate all mechanisms of hypertrophy into a single session. By only lifting heavy or only training for the pump, you will be limiting muscle growth. You will not be taking advantage of all three mechanisms of hypertrophy. People who walk into the gym not having the slightest idea of what they will be doing are already setting themselves up to fail. There should always be a goal for a given workout and a plan. This includes exercise selection, exercise order, rep schemes, tempos, rest periods, etc. If you simply do what you feel like, you will never do the hard stuff. The stuff that you need to work on. Which is what you should be doing. A program designed in 4-6 week phases (depending on your training experience) typically works best. Volume and intensity can gradually increase over the training phase. Your program should include rep ranges, rest periods, and tempos to elicit the desired training effect. Once you have the plan in place, then you simply EXECUTE. And stick to the plan. Outside of your current plan you need to plan for long-term success. Think past just your current training block or week. Create a massive action plan. Design a roadmap of exactly how you’ll progress each week and each month. Continual progress and improvement requires an intelligent plan so that you are always moving forward. In order for a muscle to grow, and the body to change, it must be challenged. Image courtesy of Get Big. You Want to Grow You Say? In order for a muscle to grow, and the body to change, it must be challenged. It must be subjected to a new stimulus or be overloaded with a new amount of stimulus. 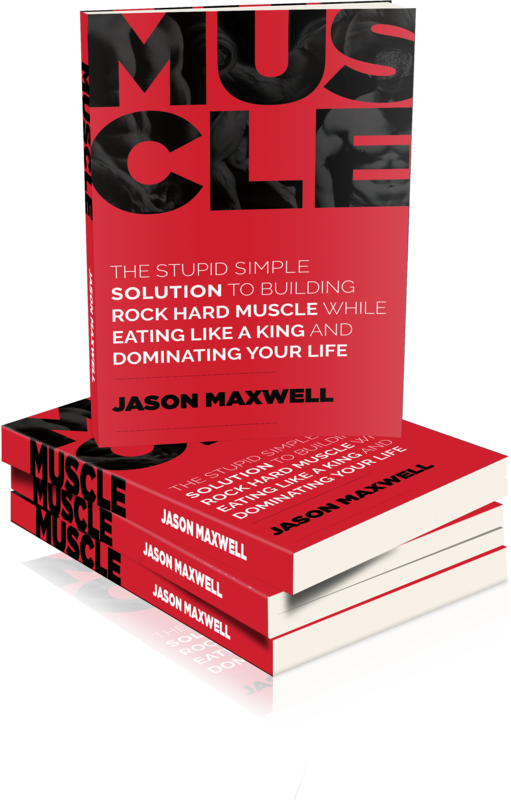 To overload a muscle, you have to increase the work or stress placed on that muscle. If you always continue to do the same thing, you will always end up with the same result and no change. Should be obvious right? Adding in volume, decreasing rest periods, and adding in intensifiers are all ways to build in slight progressions. Of course increasing the amount of weight is a very effective way. But remember, it is NOT the ONLY way. Journals and training records are a valuable yet underutilized tool to track your progress. Some people seem to think that the more work they do, the better off they are. This is not the case. More is not necessarily better. Strategic progression is better. Yes, work HARD, of course. But also work SMART, and don’t beat yourself into the ground and leave yourself nowhere to go. Ahh, but you eat tons you say? Well you need to eat MORE! It’s likely that you don’t eat nearly as much as you think. Track your food intake for a few days. Figure out how many calories you are eating. You likely need more food. It’s likely that you don’t eat nearly as much as you think. Image courtesy of You Tube. Caloric Maintenance: Eating the same amount of calories as your body burns each day. This is the amount of calories needed to maintain your weight. First, identify your genetic body type (ectomorph, endomorph, or mesomorph). Note this is a GENERAL GUIDELINE. There is no perfect method to calculating caloric maintenance. Caloric consumption on a daily basis is something that is very individualistic and different from person to person. There are several factors besides body weight that can be used to determine how many calories you should eat each day. These include the amount of muscle mass you have, your activity level, and metabolism. There are several factors besides body weight that can be used to determine how many calories you should eat each day. These include the amount of muscle mass you have, your activity level, and metabolism. Image courtesy of YouTube. Ultimately it comes down to your goals. You will have to monitor how your body is responding and adjust accordingly. It takes some experimentation to find the optimal caloric intake you should be consuming. Example: A 175 lb mesomorph will have a maintenance level of 2625 (175 x 15) calories per day. This means our 175 lb mesomorph must eat 2625 calories per day to maintain his weight. To gain weight, he would eat more than 2625 calories. To lose weight, he would eat less than 2625 calories. If you are not eating above maintenance level, you are going to have a tough time building muscle. When you are trying to build muscle and gain weight, you want to be in a caloric surplus. Caloric Surplus: Eating more calories than the body burns each day (an excess of calories). TO DO: Eat 500 calories above maintenance and adjust accordingly. This should optimize maximum muscle gain and minimum fat gain. Working with our previous example, our 175 lb mesomorph will add 500 calories to his maintenance of 2625 calories. This equates to 3125 calories. This is now his estimated caloric intake to start packing on muscle. Don’t forget your maintenance number will likely change based on changes in your body weight and activity level. So, pay attention to the rate of your weight gain and how your body progresses. If a 500 calorie surplus is allowing you to make steady progress at a good rate over the first couple weeks of your program, keep it there. *Note: A gain of about 1 lb per week is usually the upper limit for growth. And for more experienced trainees, 0.5lb per week is more realistic. If you start to hit a plateau with the same caloric intake after a few weeks and can’t gain any weight, then you may need to bump it up a few hundred calories. If you start to hit a plateau with the same caloric intake after a few weeks and can’t gain any weight, then you may need to bump it up a few hundred calories. Image courtesy of Jacked Factory. Can’t I Just Eat As Much As Possible? Won’t I Make More Gains? I’m sure you’ve heard of the bulking protocol where you don’t count any macros or calories, and just eat everything in sight. You aim to take in as many calories as possible, not worrying about where these calories are coming from. While you may put on a lot of weight using this approach, it is definitely NOT a smart path to take. There are two main problems with this approach. First, you will gain primarily fat (75% or MORE of your weight gain will likely be fat). This means not only will you look soft and out of shape for the time being, but when you do decide it is time to strip your body fat, you have a much greater likelihood of sacrificing muscle in the dieting process. You will have to diet for extended periods of time and lose a lot of weight. When it is all said and done, you will be lucky to hold onto half of the muscle gains you made. Second, you will ruin your insulin sensitivity from eating excessive amounts of carbohydrates. This means more fat storage and a harder time building muscle. Quite simply, the gains you make will go to your gut and not your muscle. Sure the scale might go up, and you’ll gain weight, but it won’t be in the right places. If you train hard, you have to recover to grow and benefit from training. Without proper recovery, you are just wasting your efforts and throwing away progress. Remember: You stimulate growth in the gym, but you grow outside of it with proper recovery. How well you allow yourself to recover in between training sessions dictates progress. The first mistake that negatively affects recovery is neglecting sleep. Adequate sleep is an essential part of recovery and growth. Neglect it and you will kill your gains. Having enough sleep will ensure your hormones are functioning optimally. It will also keep energy levels high throughout the day. Strive for 7-8 hours of sleep per night. This might mean giving up an hour of your favorite show on Netflix before bed in order to get to sleep at a reasonable hour. If you are serious about your results, you need to make sleep a priority. Yes, if you focus on hitting your macronutrient targets consistently you will make great progress and get results. First things first- you have to nail down your caloric and macronutrient targets. But when looking to get the best results possible, nutrient timing matters and makes a difference. It may not matter all the time, but there are certainly times of the day when it gives you an advantage. The first thing to look at in regards to nutrient timing is protein content in each individual meal. The goal with each meal you eat should be to increase protein synthesis to maintain a positive nitrogen balance. A positive nitrogen balance means the body is creating new proteins faster than it is breaking them down. This is the ideal scenario for muscle building. To increase protein synthesis at each individual meal, you have to get adequate protein. If you do not get enough protein in a meal, you will not hit the threshold to increase protein synthesis. Image courtesy of Get Your Fit Together. To increase protein synthesis at each individual meal, you have to get adequate protein. If you do not get enough protein in a meal, you will not hit the threshold to increase protein synthesis. You will not get the anabolic effect from the meal that will improve recovery and growth. So how much protein per meal is adequate to stimulate protein synthesis? For men, 25-40g of protein at each meal is sufficient- depending on the source of protein and individual body size. For women, 15-25g of protein at each meal is sufficient- depending on the source of protein and individual body size. Note: This does not mean 40g for men or 25g for women is the upper limit or maximum amount of protein you can eat in a single meal. Protein content can be higher, but it will not further increase protein synthesis past this point. The next thing to look at in regards to nutrient timing is pre, intra, and post workout nutrition. By consuming specific nutrients at these times, you can optimize the environment for growth to occur. This will supply amino acids to protect muscle tissue and kick-start the recovery process (protein has both an anabolic and anti-catabolic effect). Stick to a lean protein source that is easily digested and low in fat such as white fish, chicken, turkey, or egg whites. A whey protein isolate is also an option. The purpose is to provide a subtle release of insulin and help prevent muscle breakdown. These also increase blood flow and muscle pumps, which can in turn lead to increased muscle growth. Good choices are things like oats, sweet potato, or low GI fruits (such as an apple). In general, fats in this meal are too slow to digest to be used for fuel during training. However, there is one type of fat that can actually be very beneficial to eat pre-workout. This type of fat is medium-chain triglycerides (MCTs). MCTs are unique compared to other fats, as they are able to be directly transported to the liver and used for immediate energy. These fats are found in Coconut oil (60% MCTs) as well as isolated MCT oil. They can be a great addition for increased energy, especially if you are on a lower carb diet. Nutrient timing includes pre, intra, and post workout nutrition. By consuming specific nutrients at these times, you can optimize the environment for muscle growth to occur. Image courtesy of Jacked Factory. Think of free form amino acids such as BCAAs like pre-digested proteins. The rapid availability of BCAAs is what makes them so effective. They raise free-form amino acid levels almost immediately, making them very anti-catabolic during training. This means less muscle tissue breakdown. The goal here is to reduce/manage muscle protein breakdown. During the workout is a great time to take in some extra calories. Your body is primed to partition those calories most effectively. Simple carbs can supply energy to train harder, maximize endurance and resist fatigue during training. I suggest a shake containing BCAAs in addition to some simple carbs like Highly Branched Cyclic Dextrin or Vitargo. Mix these ingredients together and consume the shake during your training session. The goal is to increase muscle protein synthesis. This will initiate the repair process of damaged muscle tissue and kick-start growth. Muscle fibers need to be built back up so that they return stronger than before. Specifically a fast-absorbing, easily digestible protein is optimal at this time. Good sources include anything that is lean. Chicken, turkey, lean red meat or fish are all good choices. A liquid protein shake containing whey protein is also an option. Itcan be superior in some cases due to its convenience and fast absorption (although it is not mandatory). The purpose is to replenish glycogen levels and assist in speeding recovery from training. This is the most crucial time of the day to consume carbohydrates. If there is one meal of the day where someone on a low carb diet would eat carbs, this would be the time. People eating higher amount of carbs should plan for their largest serving here. Liquid carbs like dextrose or the other intra-workout carb sources mentioned above (Highly Branched Cyclic Dextrin, Vitargo) can be consumed at this time to deliver a fast insulin response, which is very anabolic and helps drive nutrients into muscle cells after training. The purpose of carbs postworkout is to replenish glycogen levels and assist in speeding recovery from training. This is the most crucial time of the day to consume carbohydrates. Image courtesy of Shape Your Energy. Notes: Post-training is one time when a spike in insulin won’t promote an increase in body fat. Due to the muscles being in a depleted state, nutrients are favored to be used for purposes of building lean muscle as opposed to being stored as fat. Low GI carbs like yams, oats, whole wheat bread, whole wheat pasta, rice, and most fruits are also good choices. With every repetition you perform, there should be a conscious intent to generate maximal tension in the muscle you are trying to work. If you are smiling and flirting with girl from the bar mid-rep, I guarantee you are not producing a fraction of the amount of tension you could. Single Arm Bicep Concentration Curls come after Deadlifts. Always. Significant progress doesn’t happen by accident. It requires an intelligent plan and attention to detail. If you bring any sort of book with you to the gym, it is a training journal. If it’s a magazine or anything else, you don’t lift. If you find yourself checking your Facebook news feed between sets, you also don’t lift. The only thing you might need to check between sets is what’s on the menu for your post-workout meal. Just kidding. The only thing that matters is the next set. Turn the tables on these often overlooked aspects of muscle building and you will be well on your way to growth. Time to take your gains to the next level. Schoenfeld, Brad. “The Mechanisms of Hypertrophy and Their Application to Resistance Training.” Journal of Strength and Conditioning Research. 24.10 (2010): 2857-2872. Garrett Hayden is an Online Fitness Coach, Personal Trainer, and WBFF Pro Muscle Model. His own experience and research in the field combined with training others have provided him the skill set needed to help individuals with similar goals work through roadblocks and pack on serious muscle while getting lean. For more information about Garrett, and to download his free eBook “30 Tips To A Better Physique”, please refer to www.garretthayden.com.